Cooking With Carlee : Irish Tea Brack. Top ‘o the morning to you! Now that it is March, it seems like a few Irish recipes are in order. I think everyone has a favorite way of doing corned beef and cabbage, so I didn’t want to go right there. I always love trying something a little bit different and fun. So, this brack seemed like a wonderful option. If you haven’t heard of tea brack before, you are not alone. You should certainly get familiar though! 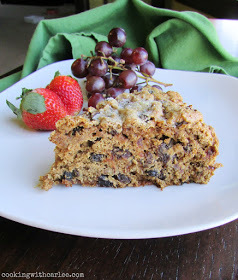 A brack is a fruit filled breakfast cake that goes great with a hot mug of tea or coffee. It looks like it might be too sweet, but it really isn’t. it has a texture similar to a quick bread, but doesn’t have any of the butter or oil. The flavor reminds me of a bowl of raisin bran in cake form. It kind of makes me want to eat it with milk and a spoon! Previous Post Everything Happens For A Reason + A Post Of My Own .